As in most cities worldwide, Copenhagen has limited space and a growing population. Copenhagen is expected to grow by 100,000 inhabitants by 2025, increasing the population from 537,000 to 637,000. The City of Copenhagen expects that the families and young people moving to the city will require an estimated 45,000 new homes. As part of our Energy Study Tour, we spent an afternoon in Ørestad, a development project expected to house 20,000 people, and employ 80,000 people. City developers are excited about the development’s location and infrastructure, which includes easy access to the metro, airport, and railway, as well as roads and bicycle paths. 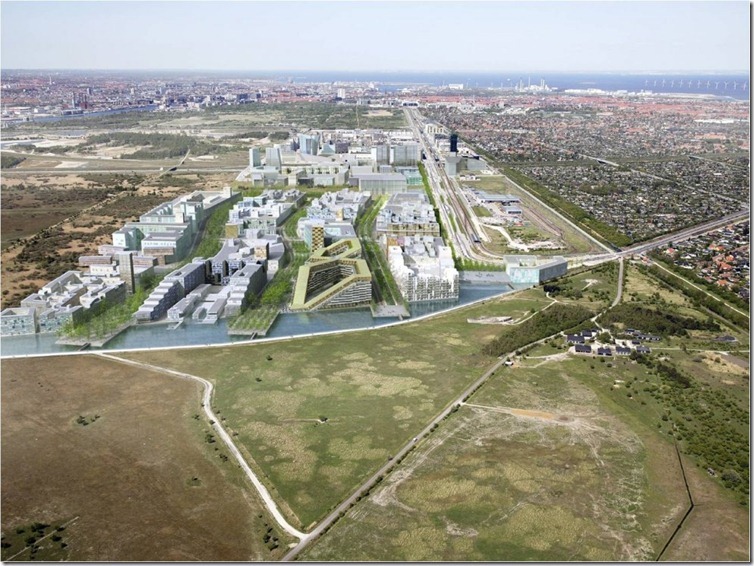 The Ørestad Development Corporation was founded in 1993 to manage the area’s growth, and is owned by municipality of Copenhagen and the Ministry of Finance. As the result of an international architectural competition in 1994, Ørestad was divided into four districts and the first office building was built in 2001. As of now there are over 3,000 flats and 2,067,747 square feet of office space built, and over 5,000 people are in residence. The area includes private, cooperative, and subsidized housing for families, students and individuals. As we walked through Ørestad, I tried to imagine what it would be like to live there, and how living there would change my carbon footprint. 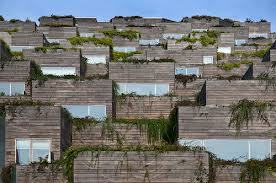 The crowd pleaser was Mountain Dwellings, a housing development designed by award-winning Copenhagen/New York architects BIG (Bjarke Ingels Group). I admit to being totally intrigued by this building, in great part because it features a giant mural of the Himalayans commissioned from a Japanese photographer. The building has the appearance of having been built on the mountain ridge–a compelling visual in the utterly flat, pastoral landscape. A public staircase on the outside allows people to “climb” the mountain, and a local mountain climbers association is planning to add a climbing wall near the peak of the mural. There is something very cheeky about how the Mountain Dwellings’ high-tech urban design embraces interpretations of nature. Interestingly enough, the building, in the heart of a development that is committed to limiting car use, is 66 percent parking (enough spots for 480 cars) and 33 percent living space (80 penthouses). That’s six parking spaces per unit; the architects refer to the “symbiotic relationship” of the two functions. In another nod to nature, the garage features a series of murals by French street artist Victor Ash, including wildlife scenes of elk, wolves, and moose standing on top of piles of wrecked cars. On the far side of the mountain mural, a series of lovely, private wooden terraces and gardens cascade down the face of the building, providing light, air and views. A watering system captures rainwater to maintain the gardens (the Coolist calls it “a green roof design on a grand scale”). Another article I read reminds that Mountain Dwellings is expensive to live in, and one of the architects agrees that without a generous government subsidy, Mountain Dwellings probably would not have been built. Most of the living spaces we saw in Ørestad appeared much smaller than suburban houses in the U.S., though the development was generously spaced with green areas compared to many U.S. cities with high population density. The footprint of the buildings is smaller as well, and shared common space and green areas mean that independence and privacy are maybe less available, and maybe less important than in the U.S. I wondered about the amount of stuff Americans have. Limited living space reduces the amount of stuff people own. Things in Denmark are more expensive than in the U.S. and their higher prices may better capture the real cost (and the negative externalities) of production. The accessibility of public transportation is a key feature, and I would imagine that for those living in Ørestad, the convenience of the metro, bike paths, and train far outweigh the hassles of commuting by car. Copenhagen’s 2025 Climate Plan incorporates urban development, ensuring that the entire area’s energy infrastructure is carbon neutral. Here in Maine, we can be sure that the state and local governments would never subsidize the development of a low-impact, artistic, luxury apartment complex. A brief look at Bayside, an urban neighborhood in Portland, Maine, reveals similarities in a focus on economic development, mixed income housing, green space, bike paths, and public transportation. But market and development forces are balanced differently. 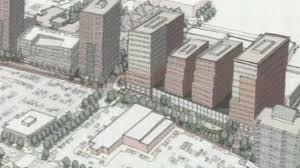 In Portland, building codes are being revised to allow for the build of the highest high-rise (not green) ever to be built in the city, and plans are less concrete about creating an economically diverse neighborhood. The area includes multiple garages and parking spaces to attract drivers from the I95/295 corridor. Without significant government development budgets and subsidies, bringing outside money to the neighborhood and to the development process becomes all important. Without a Climate Plan for Portland or for Maine, environmental and sustainability issues are less of a priority than economic growth. 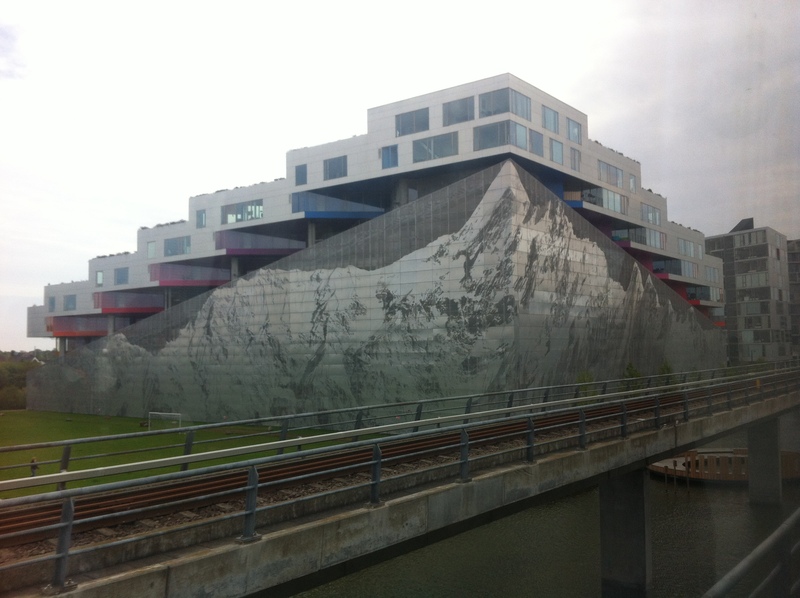 That said, our walk through Ørestad revealed few people out and about. Granted, we visited during the workday, and many residents were probably at work and at school. Bayside is bustling during the daytime, with shoppers, bikers, drivers, workers. It will be interesting to visit Ørestad in five to ten years, to see how the space fills and comes alive. And it would be amazing if Portland committed to creating a carbon-neutral plan for Bayside Development. We can hope that in five to ten years, we will see more leaders demanding green urban development plans in the U.S. This entry was posted in Community planning and development, High-efficiency buildings and tagged Bayside, community planning, Copenhagen, denmark, energy, green design, Green roofs, Maine, Mountain Dwellings, Orestad, Portland. Bookmark the permalink. Great that you intend to return to the town.